The Gray Iron Fitness Newsletter, Issue #237 Muscle Supplement That Works. Creatine Monohydrate used to be a hot item on weight training blogs and during between-sets conversations at the gym. Then when it was revealed some years ago that many top athletes were also big time steroid users, the term “substance abuse” became part of everyone's conversation. Unfortunately when substance abuse was mentioned in the news, creatine would often find its way onto a reporter's list of illegal and/or dangerous substances. But creatine, as they say, got a bad rap. Why? Because creatine was not and is not illegal. It is also not a steroid, or related to steroids. We don't hear as much about it anymore, but some subscribers have mentioned using it. I had practically forgotten that its safety and legality were ever in question. Creatine has been around the bodybuilding world and athletics for many years now. It is one of a few bodybuilding supplements that so far as we know is both safe, when taken in appropriate amounts, and actually does what is claimed. Athletes have used it because it helps in their ability to perform short bursts of speed and power and to develop strength and muscle when coupled with resistance exercise. Years ago, I used creatine for several months and became somewhat stronger in most exercises, and my muscles felt fuller. I have to say that it worked as promised and there were no negative side effects. So why did I stop taking it? Because the long-term effects were still unknown. Now more years have passed and as far as I know there are no reported long-term ill effects. 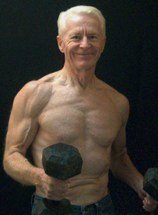 Younger seniors especially may still be interested in pushing their limits as far as muscle growth and /or power are concerned. And I came across the following report in Science Daily. It is from a 2007 double blind study on creatine. "While exercise is a proven way to prevent the loss of muscle mass, a new study led by McMaster researcher Dr. Mark Tarnopolsky shows that taking a combination of creatine monohydrate (CrM) and conjugated linoleic acid (CLA) in addition to resistance exercise training provides even greater benefits. "The study to be published on Oct. 3 in PLoS One, involved 19 men and 20 women who were 65 years or older and took part in a six-month program of regular resistance exercise training. "In the randomized double blind trial, some of the participants were given a daily supplement of creatine (a naturally produced compound that supplies energy to muscles) and linoleic acid (a naturally occurring fatty acid), while others were given a placebo. All participants took part in the same exercise program. "The exercise training resulted in improvements of functional ability and strength in all participants, but those taking the CrM and CLA showed even greater gains in muscle endurance, an increase in fat-free mass and a decrease in the percentage of body fat. "'This data confirms that supervised resistance exercise training is safe and effective for increasing strength and function in older adults and that a combination of CrM and CLA can enhance some of the beneficial effects of training over a six month period,' said Tarnopolsky, a professor of pediatrics and medicine. "This study provides functional outcomes that build on an earlier mechanistic study co-led by Tarnopolsky and Dr. S. Melov at the Buck Institute of Age Research, published in PLoS One this year, which provided evidence that six months of resistance exercise reversed some of the muscle gene expression abnormalities associated with the aging process." As always, I recommend telling your personal physician about any supplements you are considering. Happy autumn to all in the Northern Hemisphere. And happy spring to all in the Southern Hemisphere.